Improve your life style and make your business stand out. Supports Miracast, Airplay and DLNA WiFi which can let you have wireless photo, video, music transfer. PS3/ PS4 to enjoy games; 3.5mm audio jack support headphone/ external audio device. Supports sync screen technology which can sync your phone displays to a larger screen to make you game experience more real. 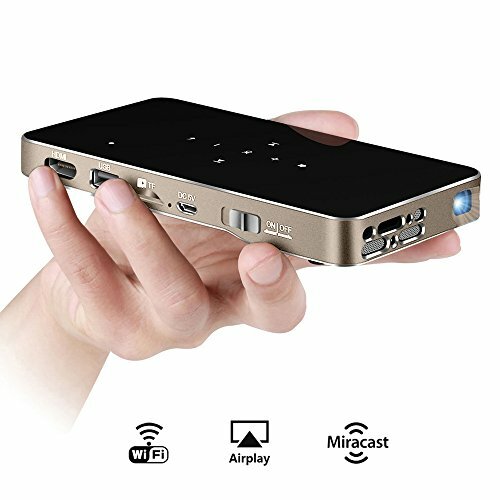 Pico projector will last you for years to come. Watch your favourite movies on the go, the P1 will never let you down. Small size, portable, ideal for carrying and outing. Tell us if something is incorrect. Thank you. CLEAR IMAGES: With DLP Technology, can projects a clear image without inflicting the same optical harm as TVs, laptops, and tablets. This technology saves your eyes while still allowing you to enjoy movies, sports, TV. The image size only can be adjusted by changing the distance. AMAZING WATCHING EXPERIENCE: Screen size:18-120", with a projection distance of 1.5-2.5M you can get awesome display of 60-100". Vibrant picture quality and crystal-clear sound effect bring you best visual experience. WATCH YOUR FAVORITE MOVIES ON THE GO: 80 Lumens With 1000/1--2000/1 contrast ratio, gives you clear razor-sharp images. Native Resolution 854×480 pixels, provides you clear and bright images and exceptional display quality. It's 4,500 mAh battery life allows you to enjoy video playback for up to 120 minutes. Watch your favourite movies on the go. MULTI-INPUT INTERFACES: Support Miracast, Airplay, DLNA. Equipped with HDMI Input, USB port, TF Card slot and 3.5mm audio jack. You can connect with Smartphone/ PC/ Tablet / Laptop/ X-Box to enjoy videos, movies; PS3/ PS4 to enjoy games; 3.5mm audio jack support headphone/ external audio device. RELIABLE PURCHASING: Any questions or disatisfactions with your purchase, please kindly let us know, ElementDigital guarantee you replacement or refund within 180 Days, and Lifetime Warranty. Clicking the Yellow "ADD TO CART BUTTON" Above, it's yours today. If you have any questions about this product by ElementDigital, contact us by completing and submitting the form below. If you are looking for a specif part number, please include it with your message.